The ever-changing OLLI faculty is at the heart of the OLLI member experience. We welcome and appreciate new and returning instructors, and invite course proposals that range from academic subjects to skills and activities. We also encourage a variety of teaching formats, including facilitated discussions of books, films or ideas; informational lectures; hands-on instruction; and field trips. Our volunteer instructors have found that teaching, in some cases for the first time, to be a rich and rewarding experience. The topic selected may reflect either vocational expertise or an avocational passion. 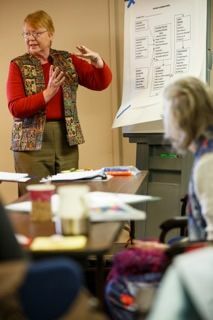 Invariably, OLLI instructors report that the teaching process deepens their own knowledge of the subject matter. The relationship between instructors and students at OLLI is uniquely egalitarian. OLLI members are in an instructor’s class by choice. There are no tests or papers to grade, and the classroom environment is casual and relaxed. OLLI students bring their own expertise and life experiences to the classroom, which makes for lively exchanges. OLLI instructors do not need to be an OLLI member, hold a particular degree or have taught previously. What we do require is knowledge of the subject matter, thorough preparation, sensitivity to different learning styles, adherence to OLLI policies and guidelines, and an ability to communicate concepts in a clear fashion. For health-related courses, licensure in the field being taught is required. Realistically, not everyone was born to teach, and not all topics will attract students. OLLI reserves the right to assign its classroom space to individuals who best meet member interests. The OLLI office staff receives course proposals, clarifies information on the forms, schedules courses, and prepares the quarterly course catalogs. The all-volunteer OLLI Curriculum Committee reviews course proposals, provides instructor support and training, and accepts or rejects courses based on OLLI policies. While OLLI does not pay its instructors, we do offer instructor benefits that go beyond personal satisfaction. Instructors receive a credit voucher based on the number of course sessions they teach that can be used towards OLLI membership fees. Some OLLI courses also qualify as SOU one-credit courses. Click here for more information about one-credit courses. Instructors receive special privileges at SOU’s Hannon Library, depending on whether their course are in the one credit program or not. The privileges expire at the end of the term. Instructors of one-credit courses may check out books for 21 days, audio media for 7 days, video media for 7 days, use the Summit database, and use interlibrary loan. Instructors of one-credit courses must submit a "new account" form at the circulation desk to gain database and interlibrary loans privileges. Instructors of non-credit courses may check out books for 21 days, use audio media in the library (no check out), check out video media for 7 days, but cannot use the Summit database or interlibrary loan.